How would you feel if your birth plans were suddenly interrupted and you were forced to spend the rest of your pregnancy confined to a hospital bed? For women with preeclampsia, this is a stark reality they face. 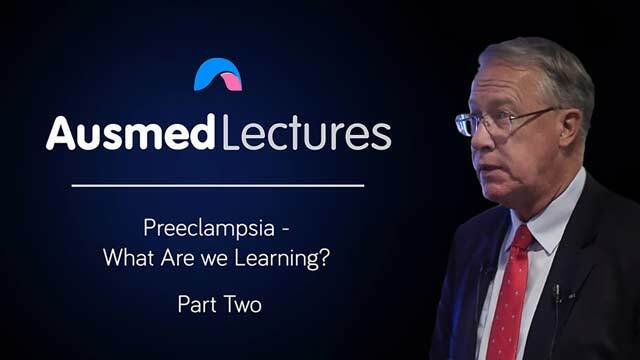 Join Professor Shaun Brennecke for part two of his two-part series on preeclampsia and learn how you can best support the woman and her partner/family through this critical disease of pregnancy. Professor Shaun Brennecke is the Director, Department of Perinatal Medicine, and Head of its Pregnancy Research Centre at the Royal Women's Hospital, Melbourne. Professor Brennecke graduated from the University of Adelaide in 1978 and in 1984 he received a Doctorate of Philosophy degree from Oxford University, England for studies on the control of prostaglandins in the perinatal period. Professor Brennecke's clinical and research interests focus on aspects of Maternal Fetal Medicine, especially pre-eclampsia, fetal growth restriction, preterm labour, placental function, the endocrinology of human pregnancy and parturition, the assessment of fetal welfare, miscarriage and factors influencing perinatal morbidity and mortality. He has published over 170 clinical and research papers on these topics. Very impressive presentation from a skilled and sensitive obstetrician. A very well informed topic which was well articulated. Great follow on piece from part 1.